There have never been more than 250 men on the site of the Eiffel Tower. The organization was very strict. This document lists the different social elements concerning the construction of the Eiffel Tower. For the store and the guard, two maneuvers, three day guards, two at night and two foams, nine men. Up to the first floor, the normal composition of the site was thus one hundred and eighty-three men, outside the office service, and was maintained with some variations, according to the needs of the site. From the first floor, the four battery teams continued to function as before. The cladding team, as a result of the operation of the first-floor elevator, was augmented by: a mechanic, a rigger at each winch, and on the ground a starter. At each lift installation, the supply team increased by the same number of men. After the completion of the scaffolding, a new team was formed which, under the direction of the chief carpenter became available, began the assembly of the gallery of the first floor; as soon as the beams of the second floor were assembled and the sandboxes removed, part of this team demolished the scaffolding. Above the second floor, when the number of cranes in service was reduced to two, two teams became available. One of the two team leaders with six carpenters was mainly assigned to the installation of the scaffolding of riveters, whose importance was very great and which were completely different from those of the assemblers. The latter were always ahead of the riveters at the height of a panel and needed fewer and less solid supports. The scaffolding of riveters was, on the contrary, a continuous floor surrounding the outer rafters and covering all the interior space; it was equipped with guardrails, and men could move without fear on this vast platform, as if they had been on the very ground. At each panel, this floor had to be raised. The lifting was done with the cranes and, as much as possible, at mealtimes. The second team leader who remained available dismounted the two cranes which had become useless and, as soon as this work was finished, he began assembling the decorative arches. Thanks to Gustave Eiffel and his book, 'The Tower of 300m', where he explains the whole construction of his tower in detail, we have valuable figures on the wages practiced at that time in the working class. It should be noted that Eiffel considered that it paid them voluntarily above the average rate practiced on the other sites. 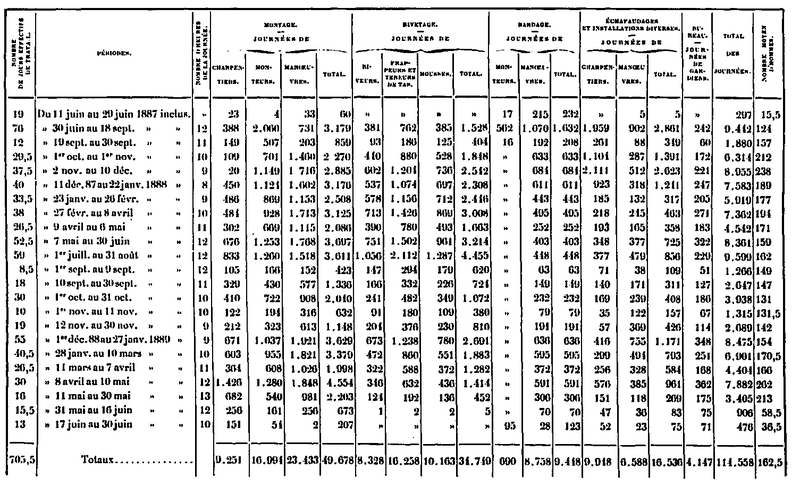 It can be guessed that the salaries were really different depending on the positions held. Curiously he treated as a single salary the team of 3 employees. He finishes with this small summary of salary costs reported on the site, a purely business approach. Which, for twenty-five months, gives the sum of 47,250 francs. This sum must be increased by 25,000 francs for various gratuities, including that of 3,000 francs remitted to the workers at the end of the construction site, for a total of 72,250 francs. The duration of the work, which was prolonged as long as the season permitted, was twelve hours during the months of June, July, August, and September; eleven o'clock in May and October; ten hours in March and April; nine hours in November, December, January and February. Exceptionally, in May 1889, we worked thirteen hours. The table below summarizes, for each period, the number of hours of work and the number of days per category of workers. These figures result from the counting of the reports that were sent daily by the site manager. These figures are empirical, they were measured on the spot, at that time, for workers rising daily to their workstations. We note that they are particularly weak, the rise times are much faster than those of visitors nowadays. No doubt the workers had a great training, they probably had great strength in the legs. At the launch of the Gustave Eiffel site insisted a lot on security. It must be said that one of the main grievances made at the tower was the number of deaths during its construction. That's why he minimized the risks, and it must be said: There was not a single death to deplore. The only one who lost his life was a young workman who, when the end of the day had been sounded, took an imprudent risk on a dangerous trench. But this accident, tragic as it may be, can not be attributed to construction. The risks of the construction were numerous. The biggest was the fall in the void, deadly for sure. To avoid this, the team leaders installed, as much as possible, railings on the platform where the workers were installed. On the ground the temporary planks were placed on the horizontal struts and fixed together, so that there is no day that can be formed between two planks. They were provided with projecting rims to prevent falling objects rolling on the planks. Another risk was falling objects. To limit it the tools were fixed on a strap attached to the worker himself. It was also forbidden to bring on the site personal effects that could have endangered anyone. Finally the team leaders were on the lookout for the moods of the workers. Together for most of the day it was essential that they get along and appreciate each other. If this was not the case, and considering that the agreement could not be made obligatory, they would watch for any excesses: They should not be able to argue, or even get to the hand. Moreover it was an important rule: No one had the right to argue with a colleague under penalty of immediate dismissal. This was also the case for anyone taking a drink: Dismissal assured, on the field! When the first platform was completely finished, a canteen was set up for workers' lunch. To engage the workers to take their meals, the quality of food was very much monitored. Prices were reduced by 20% on ordinary prices; this difference was refunded to the cantinier by the offices of the yard. This additional expense, which the yard took over, was compensated by the suppression of the loss of time due to the descent and the rise of the workmen, and by that of the fatigue which they occasioned them. The sale of spirits other than spirits and rum was forbidden, and nowadays we wonder why these two alcohols were allowed, while the prevention of alcoholism was a constant attention . The installation of a canteen in the middle of the building site would have been a big imprudence, if it had been tolerated that the men could go there to drink during the work, the excess of drink being, indeed, the cause of the majority of the accidents. This canteen was reinstalled on the second floor when the floor of this platform was completed. With these prohibitions, the canteen had very good results: it allowed the workers to rest and eat quietly for an hour, while having a healthy and economical diet. All benefited from it, and never was there reason to intervene to ensure good order. Moreover, potential disrupters were certain of an immediate dismissal in case of disputes. It must be said that at the time, it was easy to fire someone. The construction of the Eiffel Tower was rather exemplary in its organization, but it did not prevent, despite working conditions and rather good security, to be subject to a major strike that took place on 19 September 1888. At the inauguration of the first floor, which was celebrated by a large meal taken together, Gustave Eiffel announced that he took on the load of 2% which, until then, had been made on their salaries to pay insurance in case of accidents. But this encouragement, welcomed at first with eagerness, was not enough for them, and from the first floor the workers repeatedly expressed the desire for an increase in the prices of days hitherto practiced. This increase was certainly not motivated by the greater difficulty of the work nor by maneuvers made more perilous by the increase in height. Occupational risks remained the same; that a fall occurs from 40 meters or 300 meters, the result is similar: it is assured death. The vertigo, which for the real editor does not exist, is, in any case, due to the sensation and the attraction of the void. It was particularly sensitive from the ground to the second floor, in the sloping inward parts, where there is nothing to stop the view, and was no longer from the second floor, where the eye always meets a network of interlocking iron pieces. As for this height of 120 meters itself, it was far from unusual. 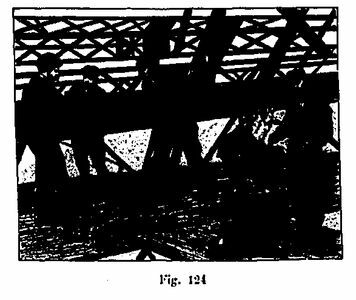 Most of the same men had already faced these heights in more dangerous conditions than at the Tower, for example in the construction sites of the Garabit and La Tardes bridges, without any difficulties. 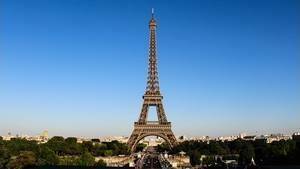 Nevertheless, the workers stopped work on September 19, and a delegation went to meet Eiffel. After various interviews and a three-day stoppage of work, it was agreed that the hourly rate for each category of workers would, from the end of August, be gradually increased by 0.05 francs for each month until the end of August. up to 0.20 francs. 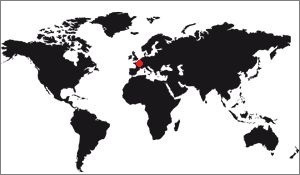 The work resumed without incident; but when we reached the intermediate level on December 20, that is to say, at the time when the gradual and monthly increase provided for by the September 21 agreement was to reach its maximum, new claims occurred, and a new strike took place. 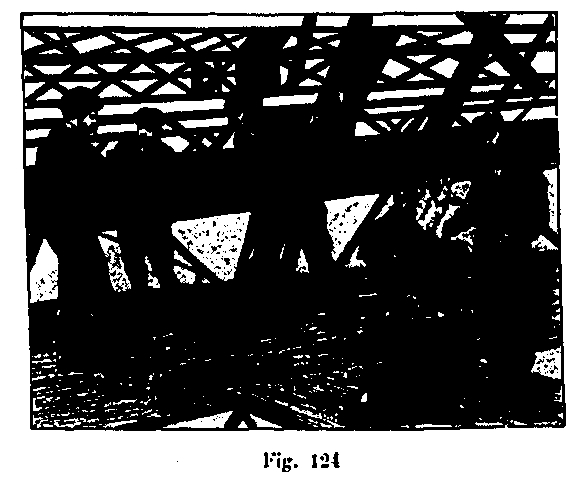 Eiffel felt at that moment that, if he made a further concession, he would give the impression that the workmen were indispensable to the smooth running of the construction site: difficulties constantly renewed could not fail to occur later on some pretext, to the detriment of discipline and hard work. Moreover, the completion of the work itself could be compromised. This he clearly explained to the workers, declaring to them that he formally rejected any new increase. To show them that he was guided not so much by money concerns as by the desire for the success of the work begun, he promised that a sum of 100 francs would be allocated as a bonus to all the editors who would continue the work. work until the flag is laid. He declared, moreover, that all those who would not be present the next day at noon, would be dismissed and replaced by new editors. Almost all of them, convinced of his firm resolve, accepted, and some men, about four per team, had to be replaced by newcomers, who climbed immediately to 200 meters, and who, after half a day, could do the same service as the old ones. This proves that with good facilities, a good engineer can work at any height without feeling uncomfortable. As for the leaders, whom he had stated that he did not intend to dismiss, but to reserve the right to use them for other, easier tasks, I placed them in the teams who assembled the first-floor arches, forbidding them, on pain of dismissal, to rise above the first floor. This measure crushed them much more than a dismissal; they were ironically named by their indispensable companions, and a short time later they were settled. This anecdote marks its era well: Nowadays, such treatment is no longer regarded as infamous. Except for these two incidents, which were quickly and happily appeased, Eiffel had no particular difficulty with his workmen, whom he considered to be full of the exceptional qualities of energy and endurance to the bad weather necessary for this work.